Chris Duffy from The Auchtermuchty Food Museum tells the story of how the purchase of a battered cookbook in 1983 snowballed into a journey of obsessive collecting. 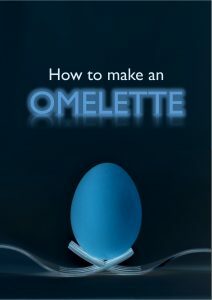 In How to make an Omelette he shares items from the collection as he tries to answer one question – WHY? Tuck into a 10 course tasting menu that includes books, manuscripts, artworks and documentary objects from the 15th Century to the present day. There’s plenty from famous names to enjoy including recipes from Alexis Soyer, Elizabeth David and Isabella Beeton. Or you can pick up some tips for preparing fish from a 10m long Japanese scroll, find that elusive cure for plague and taste letters of love from Johnnie to Fanny Cradock. Eclectic and eccentric this exhibition and accompanying talk tells a story of food, life and one collector’s search for answers.